There was also a competitive horseshoe contest at the Testicle Festival. The winning team was comprised of Arnett Young and teammate Dan Legard. 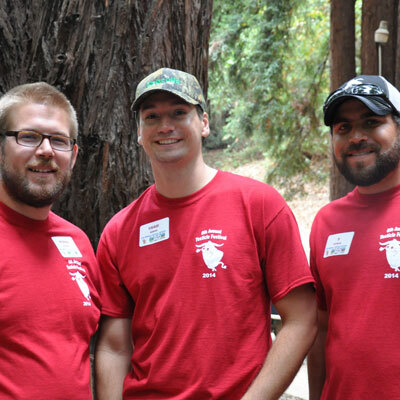 The Young Farmers and Ranchers Committee of the Santa Cruz County Farm Bureau held its 6th Annual “Testicle Festival at Estrada Deer Camp in Watsonville. The Rocky Mountain Oysters were served as hors d’ oeuvres and the sauces were enjoyed and judged by the record-crowd attending. A full chicken barbeque was served for dinner, with s’mores, made around the campfire, for dessert. The event also included a raffle, live and silent auction. If you haven’t tried a rocky mountain oyster, make sure to attend the 2015 event!